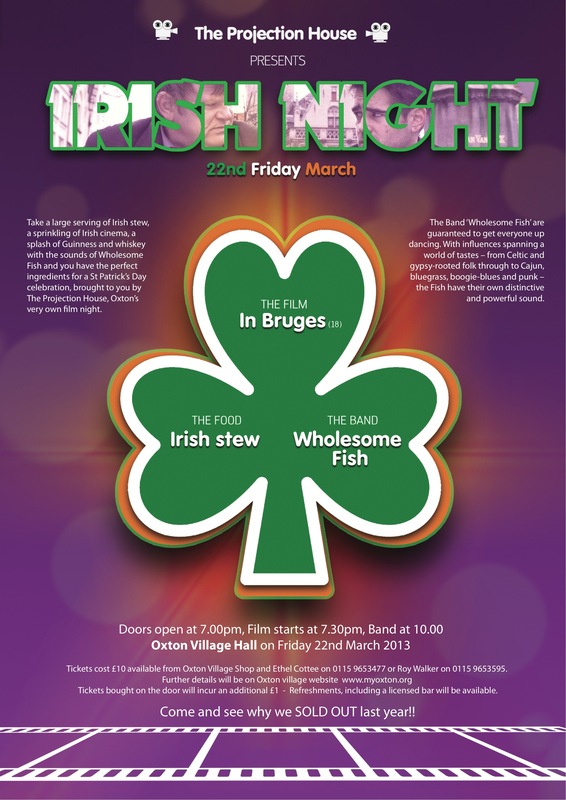 Take a large serving of Irish stew, a sprinkling of Irish cinema and a splash of Guinness and Irish whiskey with the sounds of Wholesome Fish and you have the perfect ingredients for a St Patrick’s Day celebration, brought to you by The Projection House, Oxton’s very own film night, in Oxton Village Hall on Friday, March 22nd. Following the success of the last year’s Irish Night, the group of community-spirited film fanatics are bringing the silver screen to the sticks again. Doors open at 7.00pm. The cult Irish film “In Bruges” (18) will show at 7.30pm. Starring Brendan Gleeson, Ralph Fiennes and Colin Farrell, In Bruges, a black comedy, tells the story of incompetent hitmen who are sent to lie low in Bruges after a bungled murder. The film then follows the two as they explore the city whilst awaiting further orders from their boss. If the craic’s good, why not stay for a good old Irish ceilidh from 10.00pm to midnight. The band Wholesome Fish are guaranteed to get everyone up dancing. With influences spanning a world of tastes – from Celtic and gypsy-rooted folk through to Cajun, bluegrass, boogie-blues and punk – the Fish have their own distinctive and powerful sound. Food, film and band tickets cost £10.